The Eleventh Meeting of ACAP’s Advisory Committee (AC11) will be held over 13-17 May 2019 in Florianópolis, Brazil. Documents and Information Papers, including a draft agenda (AC11 Doc 01) for the four-day meeting are now available on this web site from where they may be downloaded and consulted. Note, however, that some documents are password-protected so only their abstracts are publicly available. For convenience a meeting document (AC11 Doc 05) lists all the papers to be tabled by title and author(s). The meeting will be chaired by Nathan Walker from New Zealand, with Brazil’s Tatiana Neves assisting as Vice-chair. AC11 will follow the Ninth Meeting of the Seabird Bycatch Working Group (SBWG), and Fifth Meeting of the Population and Conservation Status Working Group (PaCSWG) in the previous week at the same venue, the Jurerê Internacional Il Campanario Hotel. AC11 will hear summary reports of both these working groups. On Thursday 16 May AC11 delegates will be given the opportunity to go on all-day boat-based excursion to the Anhatomirim Environmental Protection Area (AEPA). The 4400-ha area, created in 1992, falls within the IUCN Protected Area Category V (protected landscape/seascape). It aims to protect biological diversity and ensure the sustainable use of natural resources. Specific goals include protecting the feeding and breeding areas of the resident population of Tucuxi Sotalia fluviatilis, a freshwater dolphin, and protecting remnants of Atlantic Rain Forest and survival of local fishing communities. Southern Right Whales Eubalaena australis, La Plata Dolphins Pontoporia blainvillei and Common Bottlenose Dolphins Tursiops truncatus also occur within the AEPA. Also falling within the AEPA is the 18th-Century Santa Cruz de Anhatomirim Fortress on Anhatomirim Island which forms a part of a suite of 19 coastal fortresses (“Brazilian Fortresses Ensemble”) which was placed on Brazil's Tentative list for World Heritage status in 2015. Brazil has previously hosted the Agreement; the Second Meeting of the Advisory Committee (AC2) was held in Brasilia in June 2006. This year’s Advisory Committee and working group meetings follow on from AC10, held in Wellington, New Zealand in September 2017 and the Sixth Session of the Meeting of Parties (MoP6) held in South Africa’s Kruger National Park last year in May. The Seventh Session (MoP7) is due to be held in 2021 in Australia – when ACAP will be 20 years old. Florianópolis is the capital and second largest city of the State of Santa Catarina in the southern region of Brazil. It is served by an international airport. A coastal city situated on Santa Caterina Island with a humid subtropical climate, it has a population of roughly half a million. The island is connected to the Brazilian mainland by bridges and is known for its many tourist beaches. With thanks to Patricia Serafini for information. 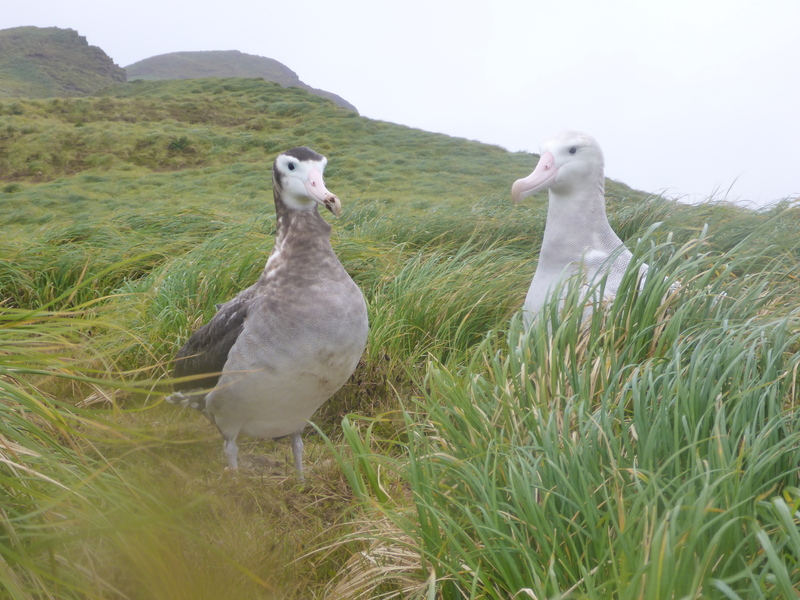 Three pairs of globally and nationally Vulnerable Wandering Albatrosses Diomedea exulans are breeding on Australia’s Macquarie Island this current season, according to information received by ACAP Latest News from Tasmania's Department of Primary Industries, Parks, Water and Environment (DPIPWE). Based on the published literature and previous ACAP Latest News postings, the annual breeding population of Wanderers on Macquarie has fluctuated over the last half a century or so, but with an overall downward trend. With only three pairs currently breeding on Macquarie the population of Wandering Albatrosses is approaching the smallest known for the species on the island. Macquarie Island is a World Heritage-status Nature Reserve; its Wandering Albatrosses breed in the most south-westerly part of the island, well away from beaches where tourists are landed. Their breeding sites around Caroline Cove and Petrel Peak fall within a Special Management Area (Category 1 – Very sensitive area) with ordinarily only researchers monitoring the species being allowed to visit with scientific permits and/or access authorisations from 1 August to 31 May. With reduced disturbance by strict zonation of the island (and the successful removal of introduced mammals by the Macquarie Island Pest Eradication Project (MIPEP) and its precursors), the main threat to the island’s remaining Wanderers is thought to be interactions of especially pre-breeding birds with tuna longline fisheries on the high seas. With thanks to Julie McInnes & Melanie Wells, Department of Primary Industries, Parks, Water and Environment for information and the photographs. de la Mare, W.K. & Kerry, K. R. 1994. Population dynamics of the wandering albatross (Diomedea exulans) on Macquarie Island and the effects of mortality from longline fishing. Polar Biology 14: 231–241. Parks and Wildlife Service 2006. Macquarie Island Nature Reserve and World Heritage Area Management Plan 2006. Hobart: Parks and Wildlife Service, Department of Tourism, Arts and the Environment. 176 pp. Terauds, A., Gales, R., Baker, G.B. & Alderman, R. 2006. Population and survival trends of Wandering Albatrosses (Diomedea exulans) breeding on Macquarie Island. Emu 106: 211-218. Tomkins, R.J. 1985. 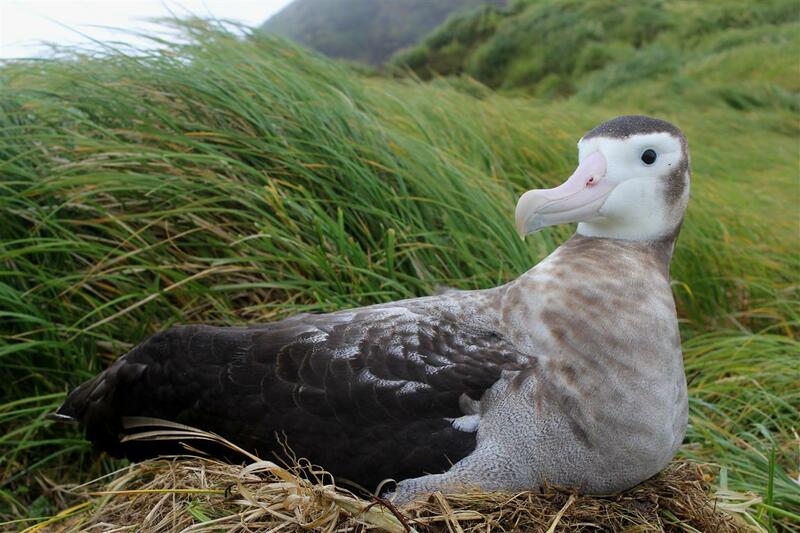 Reproduction and mortality of Wandering Albatrosses on Macquarie Island. Emu – Austral Ornithology 85: 40-42. Azwianewi Makhado (Department of Environmental Affairs, Oceans and Coasts Branch, Cape Town, South Africa) and colleagues have published in the journal Emu – Austral Ornithology on the at-sea movements of globally Endangered Indian Yellow-nosed Albatrosses Thalassarche carteri breeding on Prince Edward Island. Makhado, A.B., Crawford, R.J.M., Dias, M.P., Dyer, B.M., Lamont, T., Pistorius, P., Ryan, P.G., Upfold, L., Weimerskirch, H. & Reisinger, R.R. 2018. 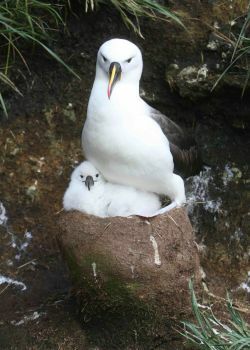 Foraging behaviour and habitat use by Indian Yellow-nosed Albatrosses (Thalassarche carteri breeding at Prince Edward Island. Emu - Austral Ornithology 118: 353-362. Jennifer Lavers (Institute for Marine and Antarctic Studies, University of Tasmania, Australia) and colleagues have published in the Marine Pollution Bulletin on assessing plastic loads in Flesh-footed Shearwaters Ardenna carneipes made up of particles under one millimetre in size. Lavers, J.L., Stivaktakis, G., Hutton, I. & Bond, A.L. 2019. Detection of ultrafine plastics ingested by seabirds using tissue digestion. Marine Pollution Bulletin 142: 470-474. ACAP’s three official working languages are English, French and Spanish. Since 2013 the ACAP Secretariat has offered an internship programme for translation students studying at Australian universities in February of each year. The students have the opportunity to gain practical experience to improve their translation skills, as well as to acquire a better understanding of the contexts in which they are likely to use these skills during their professional careers. At the same time, it is a great opportunity for ACAP to contribute to the education of translators, and in the process prepare them for the future. 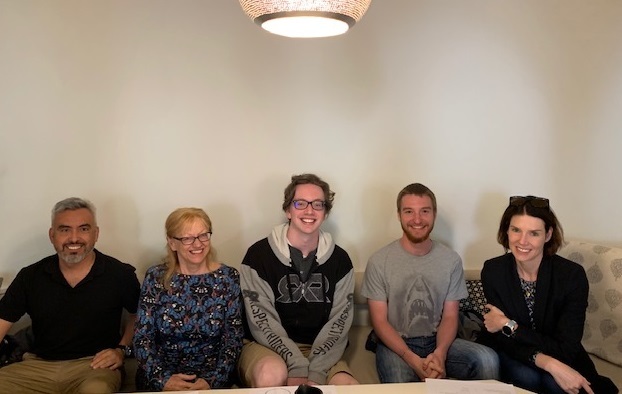 As in previous years, the 2019 cohort of language interns came from the School of Languages, Literatures, Cultures and Linguistics, Monash University, Melbourne (Olivier Lallemand and Eduardo Veliz Ojeda) and the School of Humanities and Languages, University of New South Wales, Sydney (Laurence Laveau and Kalen McCahon). They spent a working week with the Secretariat in its Hobart office in Tasmania between 11 and 15 February. 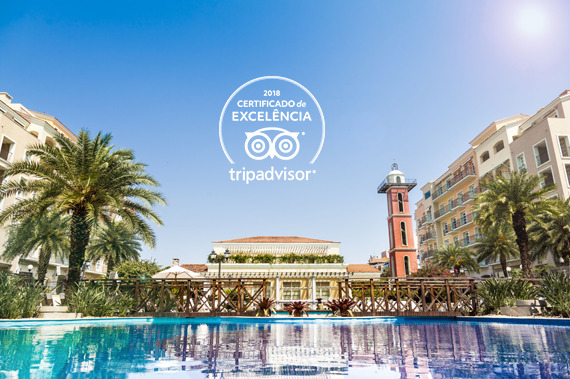 Translations were made from the Spanish into English of reports received from South American holders of ACAP secondments, as well as selected English texts into French and Spanish. See ALN reports on the 2013, 2016, 2017 and 2018 cohorts of translation students from Monash and New South Wales Universities who have worked in the ACAP Secretariat.